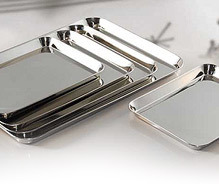 We manufacture and export an exclusive range of plates and trays that are manufactured from premium grade stainless steel. Enhance your table spread with these decorative charger plates, which are available in different designs and patterns. 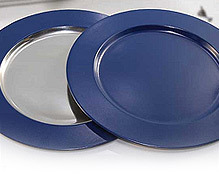 Our charger plate is available in combination of steel and other colours, which are 100% lead free and food safe. We offer elegantly designed asparagus tray for high profile dinners and buffet servings. 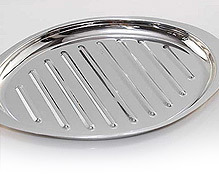 Serve your food in style on this stainless steel tray, which has handles for perfect grip. 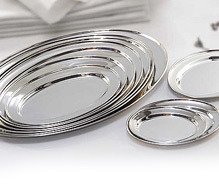 Ideal to serve drinks, deserts appetizers and more. 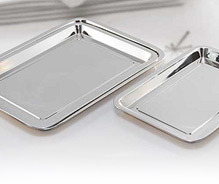 This is a classic rectangular tray with slightly slanted sidewalls with fine corner edges. This is a piece of underrated elegance and yet it is the most popular serving tray. 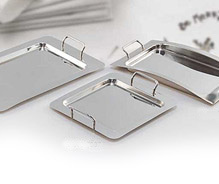 Simple yet elegant, this serving tray is available in different sizes and is the most popular serving tray. 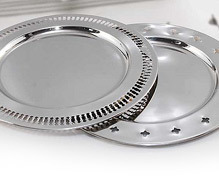 We are a leading manufacturer exporter of high quality stainless steel (non-magnetic) oval platters, a must serving utensil for high social gatherings. 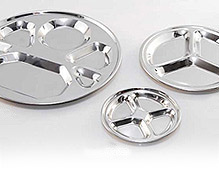 This is an exclusive item having six grooves in diamond shape so as to serve different items of the menu.